Friday night started off as most our other Fridays do. People met at the camp in Pilanesberg, where we briefly got to meet Bob Scholes, our lecturer for Veld Management. While we headed back to the Ed centre to write the mammals test, Bob started the fire back at the camp. Saturday morning started at 08:00 in a spectacular classroom – the great outdoors. We were fortunate enough to meet some warthog just before starting the lecture. Bob has a teaching style similar to that of the late philosopher Socrates, and he strongly believes that using all your senses will enhance your learning experience. Besides the fact that Bob does most of his botany analysis by taste, he is a truly phenomenal scientist. Currently Bob is back in Academia at WITS. He previously worked as Systems Ecologist at the CSIR, running a multitude of local and International projects. Prior to the CSIR he was manager of the SA BIOME programme for trees and grasses in the Savanna. Professor Scholes also studied in North Carolina State University in USA. He is also extremely involved in programmes assessing the impact of climate change worldwide, as well as a co-author of the book Climate Change: Briefings from Southern Africa. To top that, he was given the award for Foreign Associate of the US Academy of Science (only 21 are awarded each year, and it is nominated, vetted and voted for by fellow scientists). This is an extremely prestigious award, and along with Professor Phillip Tobias, Professor Bob Scholes is one of the very few SA scientists that have received it. As usual the quality of the lecture was far greater than we expected it to be. 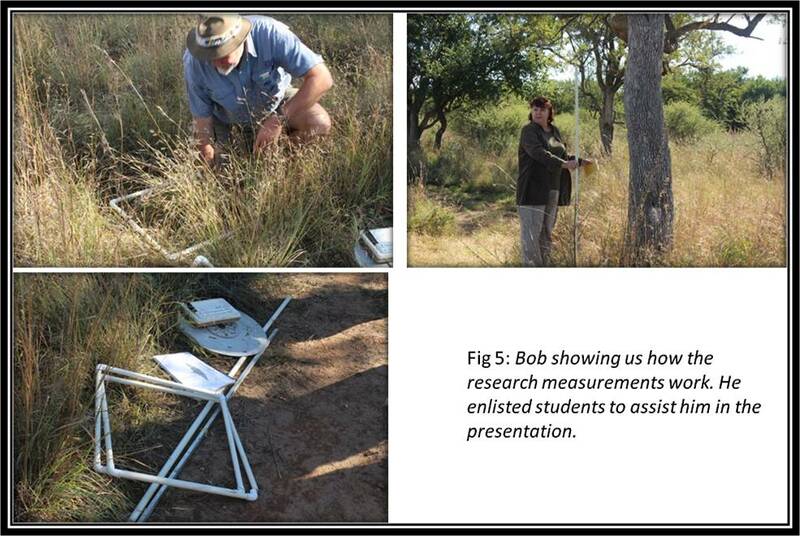 Bob engaged us with questions that sparked critical thinking, and by the end of the day our heads were filled with wonders, and a whole different way of perceiving veld management. Saturday was also filled with short walks and interesting “talks” along the way. Instead of the usually top-down strategy of veld management, we looked at the bottom-up strategy. This basically states that instead of just ‘fixing’ the problems at hand, you look for the source of the problem, and Bob explained that it often falls in the soil domain. Bob also challenged us to take a step back and to look at the big picture, instead of always zooming in on the small problems because if problems are viewed like that, it is very difficult to see the solution, he explained. In the blink of an eye it was lunch, and much like the rest of the lecture, lunch was different this weekend. We packed up and left for the Fish Eagle picnic spot where we could enjoy our lunch, and afterwards have a short lecture on the landscape that we could see from the picnic site. Then it was back to the Ed centre to finish off for the day, with a hike from the Ed centre to a sodic site. There Bob engaged us in an experiment on how to feel the content of the soil you are dealing with. This was done by collecting soil and wetting it so that you will be able to make a ball out of it. After the ball, you have to make a “sausage”. The thinner you can roll the “sausage” before it breaks, the more clay there is in the ground. We headed back to the camp famished and tired. Bob sure did a number on us! Sunday morning we were back at the Ed centre at 07:30 – bright and early where Bob gave us a last view of veld management – the role of fire and the effect thereof. He also had a few measurement tools to help with research, and we discussed how research should be approached. Bob’s style is like a breath of fresh air, and he really challenged us to think differently about everything.